While visiting the Vancouver area last month, we stayed with friends in Burnaby, a suburb to the east of the city. Some other friends from New Brunswick overlapped their stay with ours then went to a hotel in downtown Vancouver for a convention. On their last night, we met up with them for dinner. Finding a restaurant was no easy feat. Mine and Miriam’s allergies were the least of it (all British Columbia restaurant are nonsmoking (indoors anyway) so that wasn’t a problem for any place without a patio). Our Burnaby host has celiac and can’t have dairy or eggs and our New Brunswick friend can’t have a long list of items, the worst of which is peanuts (any trace of which could kill her). Cooking for all of us was fairly easy (well, I like a challenge) but restaurants are a different matter. Fortunately, I found Food Vancouver, a great listing of area restaurants, including checkboxes for different dietary restrictions, which you can add to a search by location or cuisine. Unfortunately, it’s clear that some of the restaurants who added themselves (or patrons who added them) didn’t understand the meaning of the checkboxes. We had a long back and forth with a supposedly gluten-free-friendly Chinese restaurant and decided not to bother. So we went to an Indian place that sounded promising and was an easy walk from the hotel. Davie Street is filled with restaurants and people but India Bistro was calm and quiet once we passed through the doors. No patio, no incense, no peanut oil, no problem getting a table. Our server Steve was so knowledgeable we assumed he must be an owner, and perhaps he is. He was amazing and really got our needs (aside from one common blip of saying a dish didn’t have any gluten because it was made with white flour). Four out of the six of us had strict dietary restrictions that only partially overlapped, yet he managed to keep it all in his head and warn us whenever one of us expressed interest in a dish that contained a potentially forbidden ingredient. Unfortunately, our New Brunswick friend did have an allergic reaction, but it was to some obscure spice she didn’t know she reacted to and it was not the restaurant’s fault in the slightest. But even she says, if she were local, she’d “go back there in a heartbeat,” with some precautions about which dishes she ordered of course. They don’t use eggs at all (the cheesecake, which is made off site, is the only dish with eggs). All of their breading is vegan chickpea flour and the fryers aren’t used for anything containing gluten, dairy, or eggs. But this wasn’t just a safe meal, it was delicious. Some of the best Indian food I’ve had in a long time. We started off with two chickpea-battered appetizers, both gluten-free by default: fried calamari ($6.95) and chicken pakoras ($5.95). I don’t eat meat (I do eat seafood) and have been raising Miriam the same. Michael eats meat (no pork and very little red meat) and we agreed Miriam could have turkey this Thanksgiving with the condition that she understand where the meat comes from. At the tender age of three, she has demonstrated that she understands death and that animals used for meat need to be killed. Recently, she has been asking “am I allergic to chicken?” I had to tell her no. 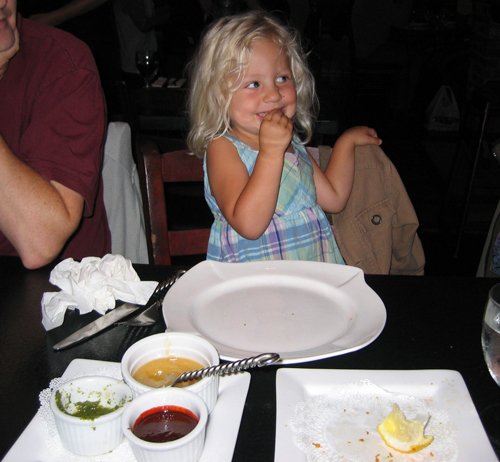 At the restaurant, she asked again, and Michael and I decided she could have her first taste of it. She was so excited she told the server and everyone else within earshot, multiple times, “I’m having chicken! I’m not allergic to chicken!” Well, she loved it. She ate about half the pakoras by herself. The rest of us devoured what was left. I only had the calamari and it was tender and delicious. We ate so quickly I didn’t get a picture until the very end. 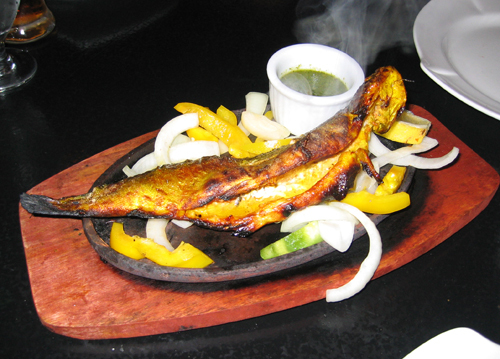 For my entree, I chose the Tandoori Trout (trout marinated in fresh ginger, garlic and spices & char-broiled. $13.95). Although the websites say it’s marinated in youghart, if memory serves me, it was actually nondairy (I can cheat with dairy and gluten once in a while). Cooked perfectly with a crispy skin and tender meat. Although the accompanying mint sauce was wonderful, the fish didn’t need anything. The table shared papadum (lentil crackers, $1.50 times 3), which were the only bread not made with wheat, rice Pulao (basmati rice cooked with cumin, onions & aromatic spices. $3.95 times 2. Vegan and delicate and great for soaking up those marvelous sauces), and cucumber salad ($3.95). The other adults ordered Chicken Jalfrazi (chicken cooked with onion, bell peppers, tomato in a light curry sauce. 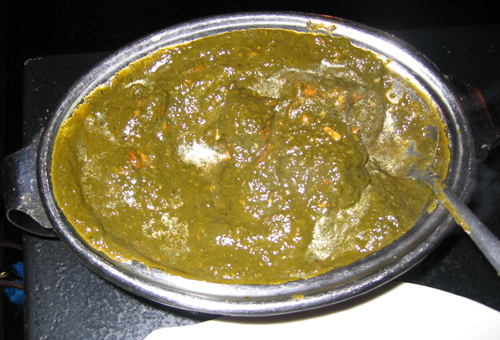 $10.95), Lamb Palak (lamb cooked with spinach & Indian spices. $10.95), Murgh Coconut (boneless chicken cooked in a unique combination of coriander & coconut curry. 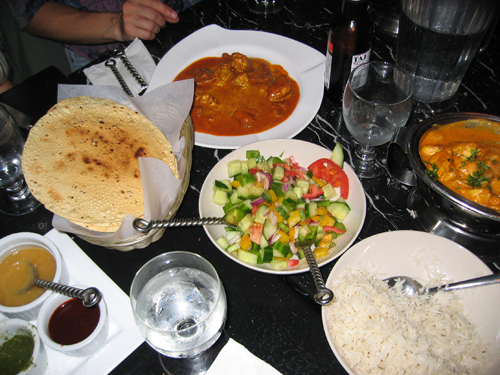 $10.95, and Lamb Rogan Josh (lamb cooked with onions, garlic, ginger and traditional Indian herbs & spices. $10.95). I tasted some of the chicken sauces and they plus some rice would have made a meal by themselves. India Bistro Dinner for six. Clockwise from bottom left: various chutneys & dipping sauces (all vegan and gluten-free), papadum, lamb Rogan Josh, Chicken Jalfrazi, rice, cucumber salad. We were in the process of ordering dessert when our friend (who left early to get some air) became ill and we had to rush out (her husband went on ahead so the rest of us could deal with the bill). Our server was preparing some samples so we could decide what to order and he sweetly packed them up with our leftovers as we paid. We ate the desserts the next day. The rice pudding (kheer) was good but the Gulabjamun (dark brown round shaped cheese balls in a honey syrup) were my favorite. The prices were excellent. Our meal for 6 people (5 adults) had two beers, 2 appetizers, 5 entrees, rice, and salad and came to $100 including tax (but not tip). Parking is a nightmare; take the Skytrain if you can. If I were local, India Bistro would be one of my regular haunts.